I spent a good part of the day double checking my motor design before I start machining the outside.I’m glad I did, because without some adjustments It would not have been possible to machine the cooling slots.I ended up making a 3D rendering of the motor, the slitting saw and the bottom eand of the mill spindle. 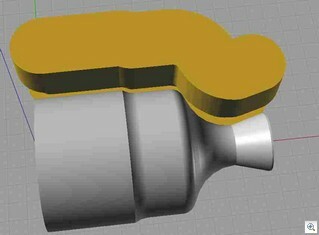 Then I adjusted things until only the cutting surfaces contacted the motor.In the pictures below the tool and mill is represented via the Gold solid as it sweeps along its cutting path. The last picture shows the general layout. Blue is the slitting saw center line path. Red is the cooling channel depth. Purple is the outer jacket (made in three pieces then welded back together. I know what the iinside of my chamber looks like, now to figure out the outside. I know what pressure drop I’m planning on at max flow in the jacket. 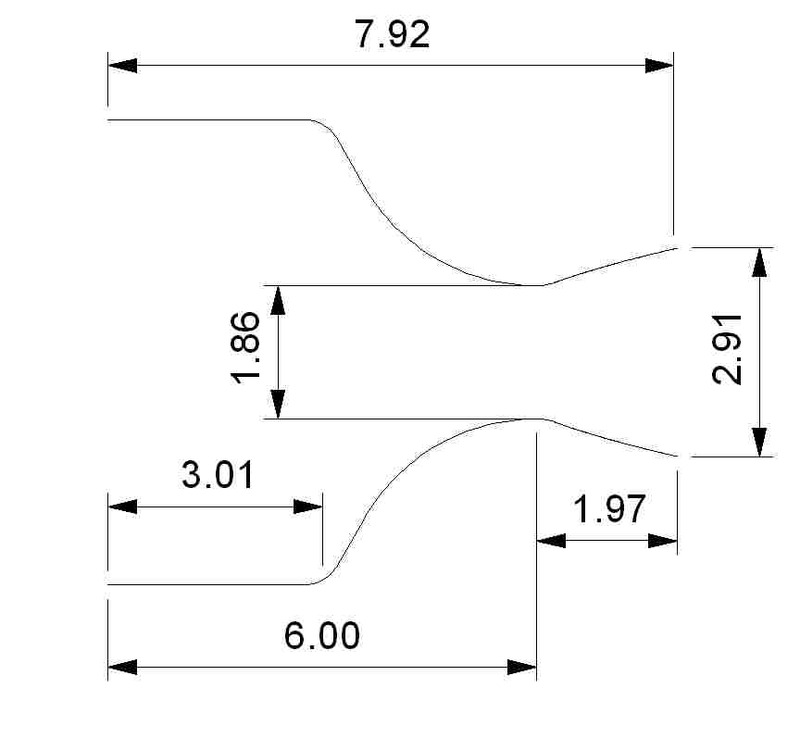 So I need to figure out how many cooling channels and their width and depth. 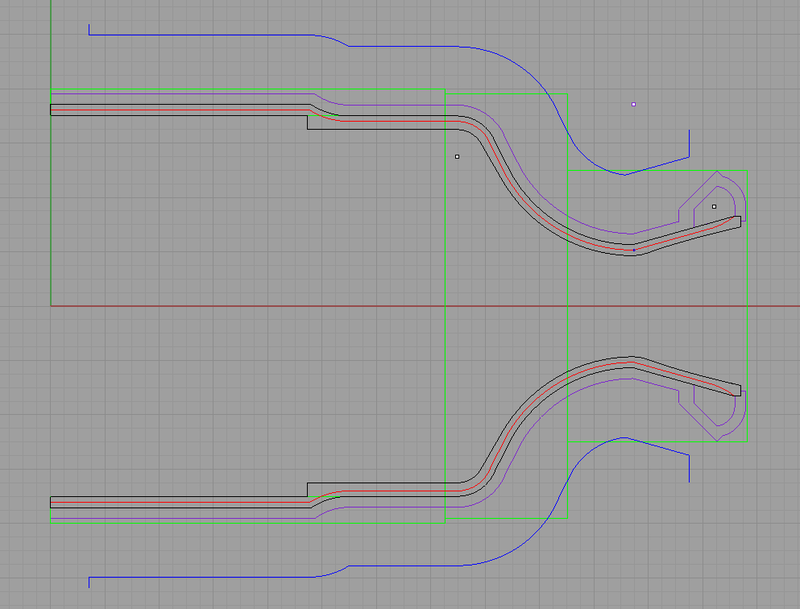 This is a bit of a black art so I drew up one pssible channel configuration and milled it as a slot in some aluminum. I then bolted a face plate against it. 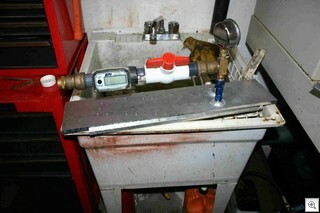 I put 18 PSI water pressure in one end and captured 10 seconds of flow that I weighed it was 390 gm. This was about 30 to 50% higher than I wanted. So I need to make them smaller, or reduce their number. 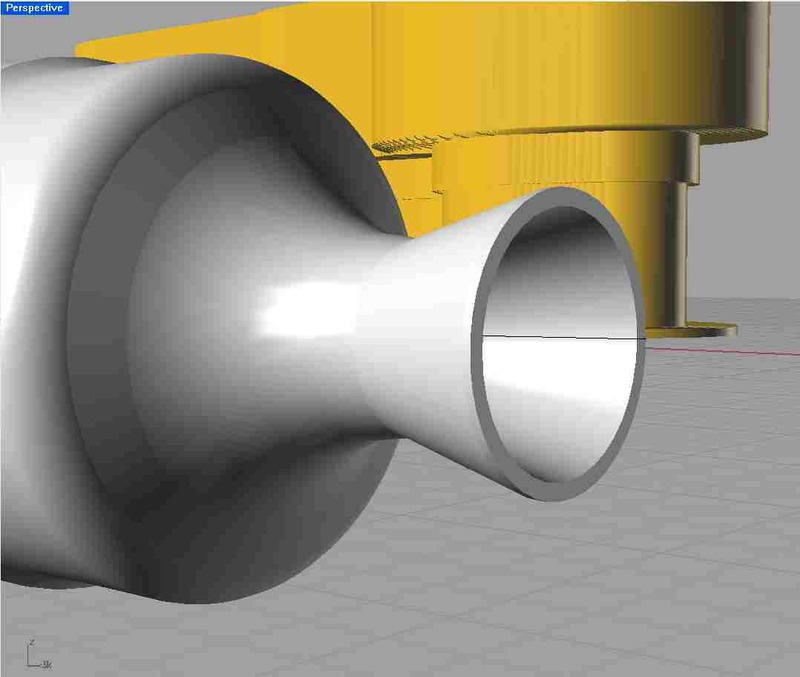 I also sent the cad model of my slot to my friends at flowmetrics and Carl was going to run a CFD check to see if experiment and simulation agree. The one big benifit to doing the simulation over the experiment is that it wont spray water on the front of your pants making the neighbors think you had an accident. 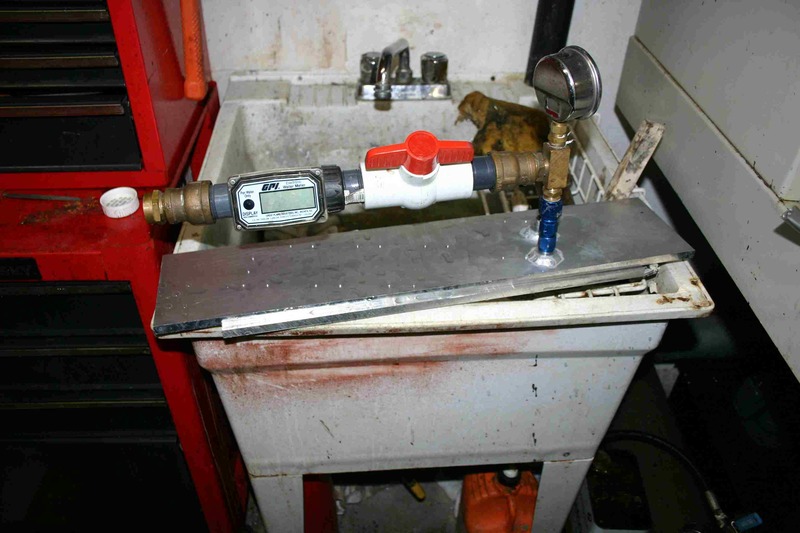 It will also allow one to do some proper heat flow analysis. My new Lathe parts work well, I finished them this morning and then I spent remainder of the day machining the inside of a motor out of a solid chink of aluminum. I am basically taking a 8” x 16” Solid aluminum round and removing everything that does not look like a rocket motor. I started at 9 am, its 1am a 18 hour day in the shop on hard concrete. My feet hurt. Since the ring catalyst failed we are evaluating two other kinds. We are looking at traditional silver plated nickel and some metal monollytic catalysts. We have some samples of the metal monolyths we received from John Carmack and we hope to test them in a regen cooled engine capable of running in Monoprop or Biprop mode in a week or two. I ordered the nickel screens and hope to fabricate a motor for that configuration in the next two weeks. I’ve been working on machining the regen engine out of a large chuck of aluminum and the size is stressing the capabilities of my lathe. 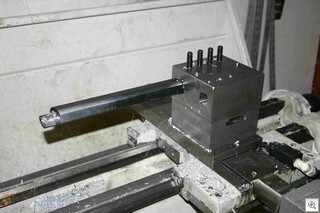 The Lathe is a manual lathe converted to CNC and the cross slide tool mount was not very rigid. I started more than a week ago to machine some new mounts and the speed control on the Mill motor started acting up. So I bought the Tormach speed control upgrade (stock on the new Tormachs) and Its a great upgrade. 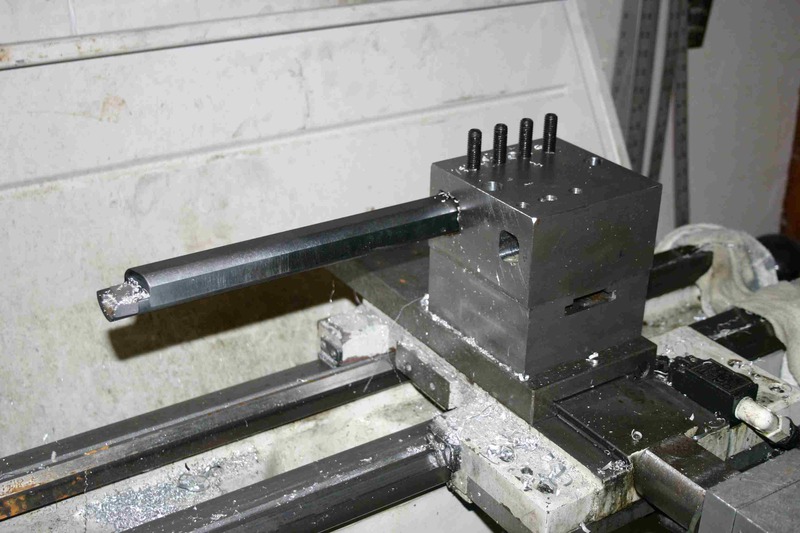 Now that is fixed, I’ve spend the last week machining new tool mounts out of large chunks of steel. they should be more rigid. 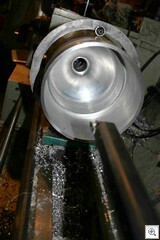 The mill is machining the last piece as I write this so I hope to get back to machining the actual motor on Saturday. 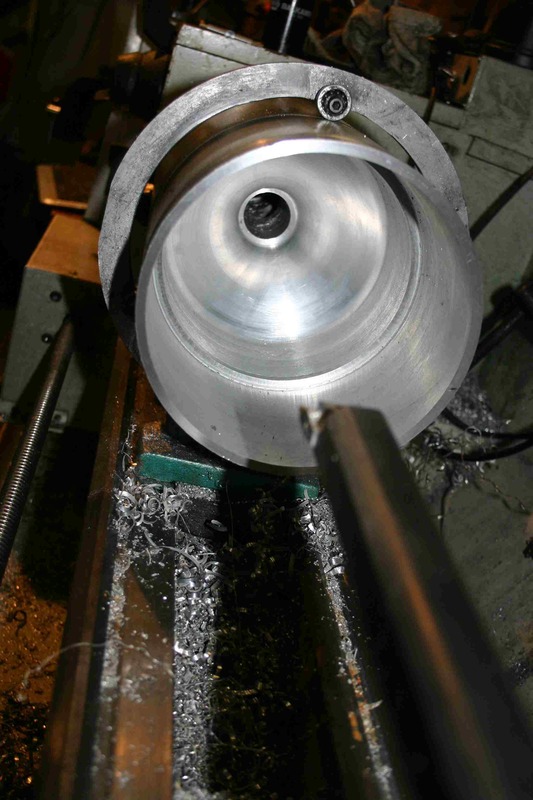 Machining Aluminum and the C145 copper is fun, Machining stainless is miserable, machining medium steel is some where in the middle, not as picky about feed rate as stainless, but still wears the tooling a lot faster than aluminum. On a side note I stick all the tools I use at the mill, draw bar wrench, vice wrench, chuck keys etc… to the back of the mill with some strong magnets. With aluminum or Stainless this is not an issue, when machining steel all the sharp chips stick to the tools making it a hazard to use them. No fun at all. Test Results: Ring Catalyst Fails. The Ring catalyst failed to get good decomposition. I have video of lots of billowing steam as the partially decomposed peroxide falls on the concrete in the flame trench. I probably won;t post these as they aren’t very interesting. We were out at FAR at the same time as the FloMetrics guys and their LR-101 rocket static test went well. 10 Second burns on both RP-1 and Biodiesel. These videos I will probably post when I get time to do so. The sound of a kerosene rocket is just different that than lox-alcohol, hybrids, solids, sugars, and mono props. They all have a different sound and the kerosene sound is very cool. Our stuff is packed we hope to do a static test of the new solid cataylist on Saturday. So you want to design a chamber, there are many ways to do this. My method is not real rigorous, but here it is. 90% peroxide /kerosene with a solid catalyst. Given a 320 PSI feed pressure we need to allocate some pressure drops, I’ll use 75 lbs in the cat pack and 20 percent in the injector /diffuser. I got the 75 PSI from a FMC peroxide catalyst pack design document. I got the 20% from word of mouth and vague references in Sutton. So the resultant max chamber pressure is (320–75)*0.8 = 260 PSI. Lots of data here but I really only want the four items I set in bold. First dimension question how big is the throat? For 915 lbs thrust at 260 PSI we need the Cf number. So Throat Area = 915/(260*cf) =2.71 sq inches in area. The Throat diameter is thus 1.859473 inches. 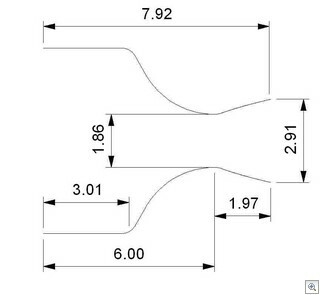 converting back to inches for a consistantcy check we have 2.72 sq in. Ae=(At*Ae/At) =2.71*2.44989 =6.65 sq in and a diameter of 2.9147 inches. So now we have the Throat diameter and Exit diameter. We need the chamber length. This chamber will have Gas/Liquid mixing so we can probably use a shorter chamber than usually, but I’m going to be somewhat pessimistic and use a L* of 50in. I’m also using some fixed catalysts at 7” so my chamber inner diameter is going to be 6.5”. 6.5” diameter is 33 sq in. 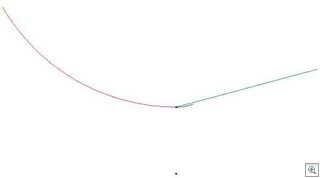 The At =2.71 so 2.71*50/33 = 4.1 inches. We now have the major dimensions of the chamber done. Area before the throat 4.1 in long. The Now to draw some shapes. One could use the classic 15 degree exit cone that would be easy to machine, but gives up a few percent performance. Or one could try and do a parabolic expansion cone. I used the RAO optimum nozzle approximation. 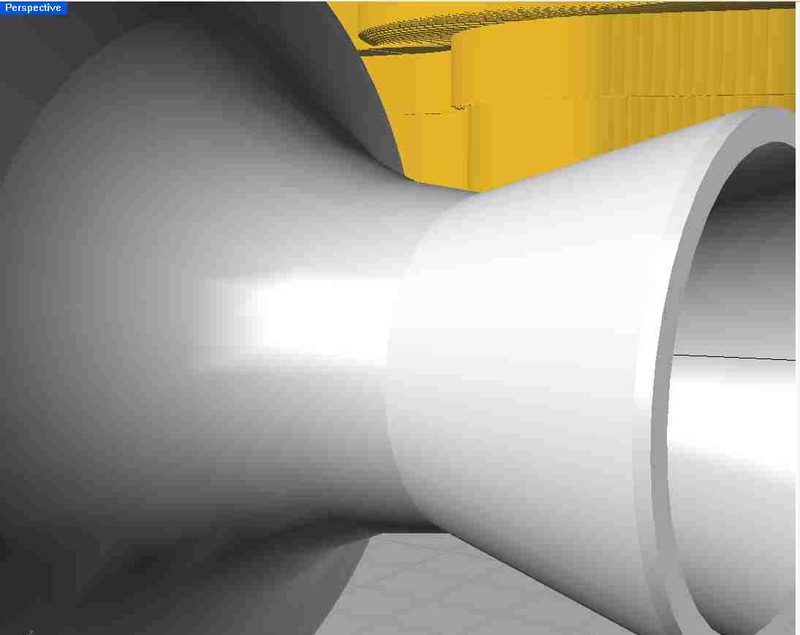 This is covered in Rao’s classic paper or texts like Modern Engineering for design of Liquid propellant Rocket Engines (Huzel/Hwang) . This requires that you pick a couple angles off a graph and fit a parabola to the resultant points. The problem is actually over specified so you have to decide which end of the parabola you want to be exact. The cook book formula gives you 4 equations and 3 unknowns. For the more math inclined you have two specified points and the slope at both points and you want to fit a 2nd order parabola through these. Like I said over specified. (You can see the document in question by doing a google book search look at page 76. 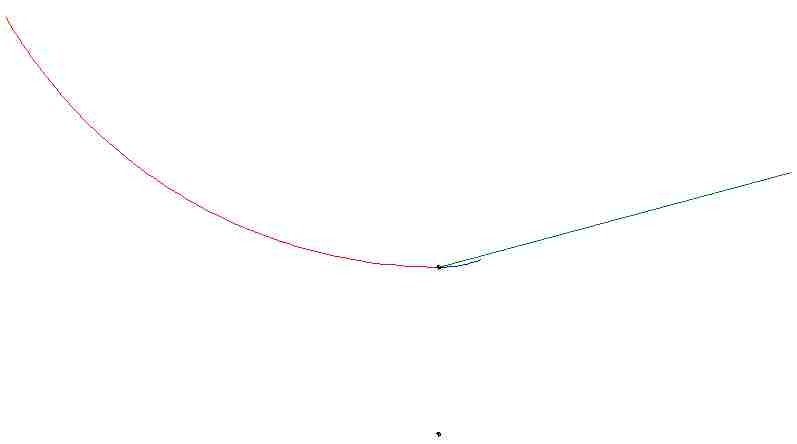 Search for Huzel Hwang) So after getting some advice and a code snip-it from arocket I wrote a short program that fits a parabola to the defined points . I assumed a 100% of conical length. So I drew the chamber in the following steps…. From the chart Fig 4–16 initial angle is ~20 degrees. So I drew an arc blue of 0.382 Rt to 20 degrees. Point at (0.239756,0.971775,0). And the end of the green line. Point at (1.97,1.4575,0). 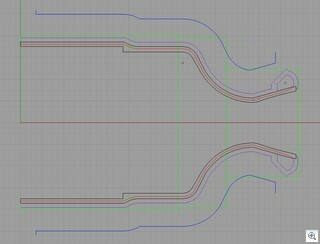 Next steps involve giving the chamber some thickness and the design of the catalyst holders and injector/diffuser seals connections etc…. to be continued….